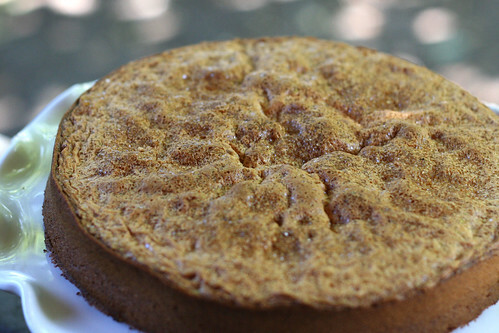 This baking of this cake was inspired by celeb chef Michael Chiarello. We're big fans of the show Top Chef, and have enjoyed the antics of Top Chef Masters (featuring well-known, successful chefs) this summer. On a recent episode, Chef Chiarello made an Olive Oil Cake, which sounded too novel and interesting not to make ourselves. I was deciding on something to bake recently to welcome an old friend of mine who was coming to visit for the weekend. Obviously when you haven't seen someone in 10 years, it's the best time to try a wild-card new cake, right? I'm pleased to say that it turned out lovely. Incredibly light texture, almost cloud-like! The lemon and olive oil flavors were the ideal subtle complements to each other. Mine was a tad overcooked even though I took it out just before the allotted 45 minutes in the recipe, so keep checking towards the end. 1. Put oven rack in middle position and preheat oven to 350°F. Grease springform pan with some oil, then line bottom with a round of parchment paper. Oil parchment. 2. Finely grate enough lemon zest to measure 1 1/2 teaspoons and whisk together with flour. Halve lemon, then squeeze and reserve 1 1/2 tablespoons fresh lemon juice. 3. Beat together yolks and 1/2 cup sugar in a large bowl with an electric mixer at high speed until thick and pale, about 3 minutes. Reduce speed to medium and add olive oil (3/4 cup) and reserved lemon juice, beating until just combined (mixture may appear separated). Using a wooden spoon, stir in flour mixture (do not beat) until just combined. 4. Beat egg whites (from 4 eggs) with 1/2 teaspoon salt in another large bowl with cleaned beaters at medium-high speed until foamy, then add 1/4 cup sugar a little at a time, beating, and continue to beat until egg whites just hold soft peaks, about 3 minutes. 5. Gently fold one third of whites into yolk mixture to lighten, then fold in remaining whites gently but thoroughly. 6. Transfer batter to springform pan and gently rap against work surface once or twice to release any air bubbles. Sprinkle top evenly with remaining 1 1/2 tablespoons sugar. Bake until puffed and golden and a wooden pick or skewer inserted in center of cake comes out clean, about 40-45 minutes. Cool cake in pan on a rack 10 minutes, then run a thin knife around edge of pan and remove side of pan. Cool cake to room temperature, about 1 1/4 hours. Remove bottom of pan and peel off parchment, then transfer cake to a serving plate. Ryan and I loved watching Top Chef Masters! I have to admit, Michael Chiarello really got on my nerves even though some of his recipes looked really good. I was really happy with the ending and who was the winner. And, now, regular Top Chef to watch! 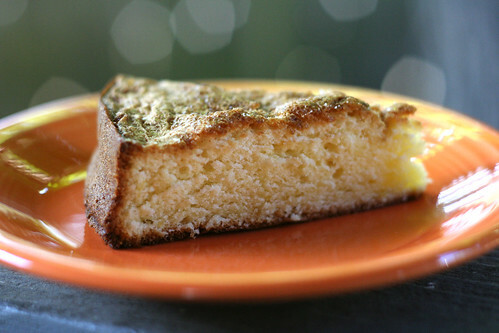 I have been wanting to make an olive oil cake for a while. Everyone always has just good things to say about them. I also did not know that Michael Chiarello was such a well respected chef until I saw him on Top Chef. I always thought he was just another guy on Food Network! That sugary top looks superb! I liked Masters, but I'm so happy we're back to regular Top Chef now. Thanks for stopping by my blog! What do you study in graduate school? I love this and am not a baking/dessert person at all... I will definitely give it a go and report back! It peaked my interest on the show as well. This looks delicious. And perfect for an alternative to the usual sweet and sugary dessert. I had to stop myself from stealing slices whenever I passed the kitchen table! !